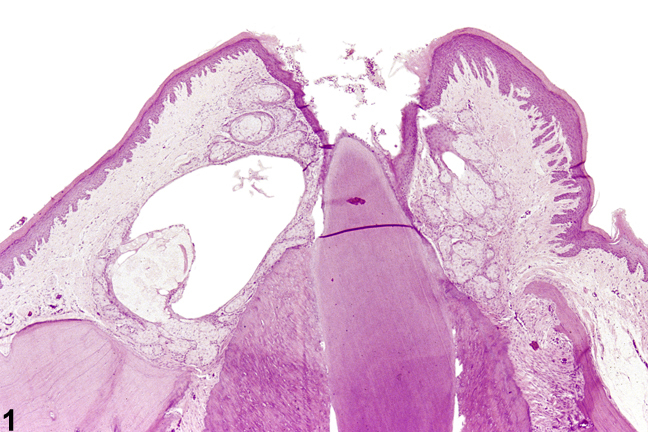 Oral mucosa, Gingiva - Ectopic tissue, Sebaceous gland in male F344/N rat from a chronic study. There are clusters of sebaceous glands in the gingiva. Oral mucosa, Gingiva - Ectopic tissue, Sebaceous gland in male F344/N rat from a chronic study (higher magnification of Figure 1). The clusters of sebaceous glands in the gingiva are adjacent to a dilated duct. 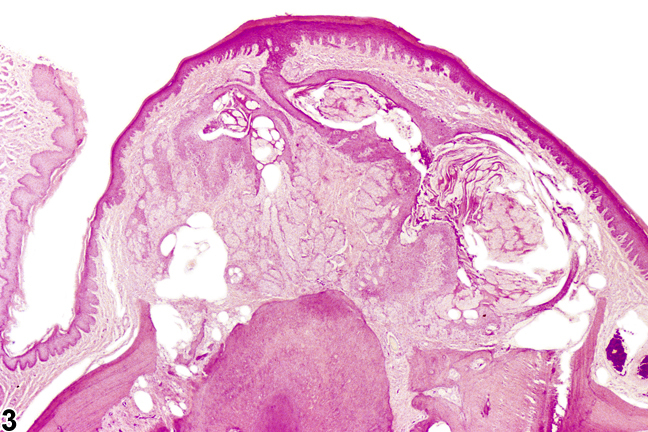 Oral mucosa, Gingiva - Ectopic tissue, Sebaceous gland in male F344/N rat from a chronic study (higher magnification of Figure 3). The clusters of sebaceous glands in the gingiva appear to feed into a dilated duct. Ectopic sebaceous glands in the oral cavity are also known as Fordyce’s granules. Histologically, these are a collection of sebaceous glands unassociated with hair follicles ( Figure 1 , Figure 2 , Figure 3 , and Figure 4 ). The glands in the molar gingiva are often associated with cystically dilated ducts filled with sebum. In one NTP study examining 734 male and 722 female F344 rats, Fordyce’s granules were very common in the midsagittal gingiva of the upper incisor in males and increased in incidence with age (34.2%, 50%, and 56.3% in 26-week, 65-week, and 2-year studies, respectively). 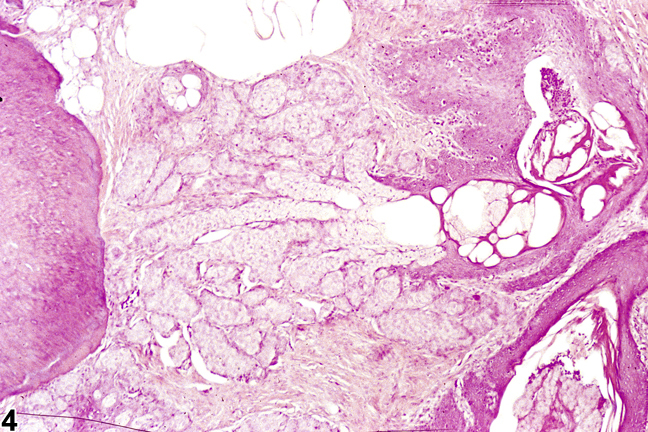 Ectopic sebaceous glands were rare in females (0%, 0%, and 2.8% in 26-week, 65-week, and 2-year studies, respectively). 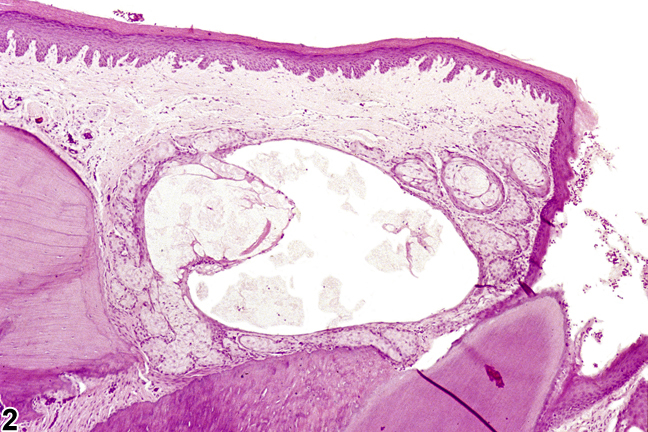 Ectopic sebaceous glands of the molar gingiva were very rare in both sexes. 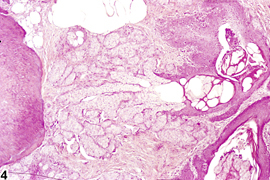 Ectopic sebaceous glands are often not noticeable on gross examination and are considered an incidental finding. This finding should be diagnosed as "Oral mucosa, gingiva - ectopic tissue, sebaceous gland." No grade is necessary. Imaoka M, Satoh H, Kai K, Kajimura T, Furuhama K. 2003. Spontaneous ectopic sebaceous glands (Fordyce’s granules) in the oral mucosa of Sprague-Dawley rats. J Toxicol Pathol 16:253-257. Yoshitomi K, Brown HR, Eustis S. 1990. Fordyce's granules of the incisor and molar gingival in F344 rats. Vet Pathol 27:432-438.